Blurb: With three weeks until opening night for their restaurant, the County Seat, Angie and her best friend and business partner Felicia are scrambling to line up local vendors—from the farmer's market to the goat dairy farm of Old Man Moss. Fortunately, the cantankerous Moss takes a shine to Angie, as does his kid goat Precious. 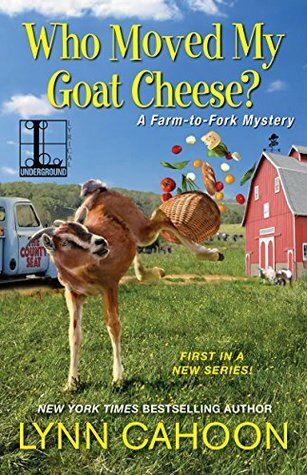 So when Angie hears the bloodcurdling news of foul play at the dairy farm, she jumps in to mind the man's livestock and help solve the murder. One thing's for sure, there's no whey Angie's going to let some killer get her goat . 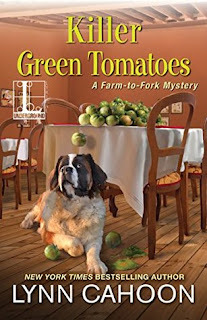 . .
Blurb: To Angie, nothing tastes more like summer than her Nona's fried green tomatoes. Eager to add the recipe to the menu at the County Seat, she's found the perfect produce supplier—her sous chef Estebe’s cousin, Javier. Just one problem: ladies’ man Javier’s current hot tomato Heather has turned up dead, and he’s the prime suspect. Somehow, between managing her restaurant and navigating a romantic triangle between Estebe and Ian, the owner/manager of the farmer's market, Angie needs to produce evidence to clear Javier—before this green tomato farmer gets fried . . . I love a big goofy dog in a story. I'm like you I like the character and setting build up, they make the mystery side of it interesting for me. The County Seat looks like a restaurant I'd love to visit! These both look like lots of fun. 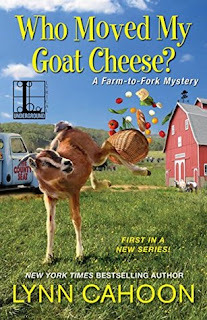 Who Moved My Goat Cheese- love that title! I'm glad you enjoyed these two! I like Lynn Cahoon's two other series very much, as you know, but something about this series just didn't grab me, so I haven't read them yet. I think it's just that for some inexplicable reason, food-themed cozies don't really appeal to me— though there are a few notable exceptions, like Connie Archer's Soup Lovers series. Those covers are fun. I'd love to try fried, green tomatoes.